Adding or repairing a patio on your home can be a lengthy task, and just like with the home itself you have to work from the bottom up. That’s why it’s important to go over your options when it comes to the overall foundation of your patio. 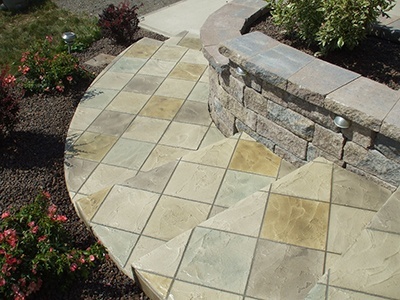 A concrete or block patio have endless possibilities which we will explore here, and determine which is right for you! With the concrete, there are many advantages and ways to create a completely unique look or design for your patio. To start off, the cleaning maintenance of a concrete patio is super low-key. All there is to it is simple sweeping ad the occasion rinse with water straight from the hose. Pressure washing may be desired a few years down the line. Another benefit to concrete is how long it lasts and also stays in the same spot even after years of foot traffic. Creativity flows freely in a poured concrete patio, leaving a blank slate for a stamped design or any other kind of design. In a paver block patio, you have similar benefits as the concrete poured patio. Blocks are a bit sturdier than concrete, not prone to cracking as much or as badly as a concrete slab would. Paver blocks also come in all different designs and shapes, so it is very aesthetically pleasing. A risk factor is involved and can be avoided if it’s paid close enough attention to and that is the blocks may cause unevenness in a walking path. This could lead to potential trips and falls; it could be necessary to fill in cracks with sand or another type of filler after some wear. Both these options leave many building options to choose from. All in all, it comes down to what you like the best, what suits your needs the best, and what fits your wallet the best. Then you can start enjoying late afternoons are your freshly finished patio.